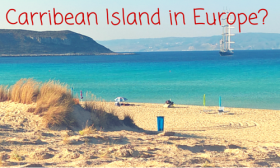 We prepared a guide on where to stay in MakriGialos, at Crete island in Greece. Makry Gialos means “Long Beach” in Greek. It is a small, picturesque, family oriented village with a 4km sandy beach. You will find it as Makry Gialos, or Makrigialos. No worries, it is the same place. Think of Europe. Then think of its most southern part. And you are on to Crete island in Greece. Now, divide the island into 4 areas starting from the West to the east and you got Chania, Rethymno, Irakleio, and Lassithi areas. Makry Gialos is at Lassithi area, the most southern part of Crete. 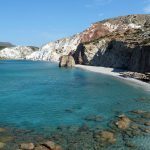 It is the most off the beaten path area of the island when compared with the massively popular areas of Chania, Rethymno, and Irakleio. The biggest cities of Lassithi are Ierapetra, Agios Nikolaos, and Siteia. These are close to each other in terms of km distance, at around 30kms, however, the streets are not that good so you may need an hour to drive from one to another. Makrigialos is 25 km from Ierapetra. It has around 500 inhabitants during the winter and much more in the summertime. 3. The accommodation prices are fairly rational. You can find a decent place for a family to stay at starting at 50 euros per night. 5. The food at Crete island is great and although the village of Makry Gialos is becoming more touristic in the past years, you can still find some nice places to eat without breaking the bank. The most economical family menu we have found is at Makis Grill. With 26 euros you can have a whole chicken, a Greek salad, tzatziki, 4 pita pieces of bread and 4 ice creams. Not a bad deal. Faros restaurant offers the best fish in the village, however, the prices are similar to the prices you find at Athens. Expect to pay at least 20 euros per person here. Two great restaurants we highly recommend are 3 km outside of Makry Gialos at an adjacent village called Koutsouras. The two Greek taverns are called Rovinsonas Crousos and Kalliotzina. They are on a small bay with tables on the sea and you can even swim after your lunch. Prices here are at 20 euros per person and the food is really nice. 6. The sunbed sets are free when you order something that costs at least three euros from the beach bar. At other Greek islands or places in Crete, you may pay 15 euros just for using two sunbeds and an umbrella. Here you can have a free set of two sunbeds and an umbrella for free for the whole day, as long add you order 3 euros per person. That is the price of a natural Orange juice. Some things to consider before choosing your ideal location here. The village has some hills which are steep and you will not enjoy ascending them, especially under the hot Cretan sun. You will see some places on the map which are only 300 meters from the beach but they are on the hill. Try to stay close to the beach so that you don’t need a car to go to the beach and back. The absolute best place to stay at Makry Gialos as a couple or family is “the white houses “. Great View of the beautiful small port and the beach, right on the beach and beautiful traditional decoration. However, this comes with a price north of two hundred euros per night during the high season. Mikri Poli is also a very nice place to stay, albeit on the expensive side too. Here is a photo of what Mikri Poli resort looks like. 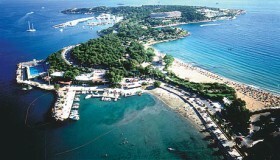 Mikri Poli is one of the two all inclusive hotels in Makrigialos. The other all inclusive hotel is “Sunwing”. The most economical and still decent place to stay we would recommend is the “Golden Star apartments ” ran by a lady called Ms. Thekla. It is 150 meters from the beach, on a small hill, so you will have to walk uphill for 3-4 minutes. The rooms are clean, spacious, with air conditioning, a fridge and a small facility to cook an omelette or boil some eggs and spaghetti. Prices start at 50 euros per night. A second value for money choice is the “Afroditi Apartments”, which is just next to the Golden Star apartments. This one has smaller rooms, but it has the plus that some of the rooms have seaviews. It also has a swimming pool, if you are a fan of them (we are not). Another great choice is to stay at Lagada bay resort. This is a resort which is a couple of km outside of the main beach of Makry Gialos. And it has a beach of its own which you reach on foot. This beach is sandy but It is not organized with umbrellas and sunbeds. For some, this is a plus, for others it is a con. Lagada Bay offers modern accommodation starting at a decent price of 80 euros per night. 2. Go with the boat to Koufonisi island. It is an uninhabited island, close to Makry Gialos. It has perfect white sand beaches. 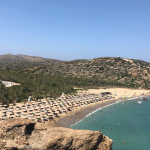 You can get tickets from an agency on the beach of Makrigialos. The daily cruises start every day at ten o’clock in the morning. 3. Eat an ice cream waffle at Hlios Kafe. This cafe belongs to the Greek celebrity Eleni Petroulaki, whose origin is from Makrigialos. 4. Visit the Agios Stefanos village. A beautiful, traditional village on top of a mountain, with stone-built houses and an intense local flavor. 10. Visit the palm tree Forrest of Vai. Then drive another few km and go to Hiona village. It is a very small village with just 3 small taverns on the sea. Try the fish at the Akamatis or Chiona tavern. Harris tavern: It serves the most “gourmet” food in Makrigialos. Here you can get excellent Pasta with Seafood, Tuna Fillet, Octopus and Seabass Carpaccio (one of the best seller dishes), risotto with seafood and lamb in the oven. Just ask Harris (the owner, who speaks great English and French) about the dishes of the day. It’s not the cheapest tavern in Makrigialos but you will enjoy the food. 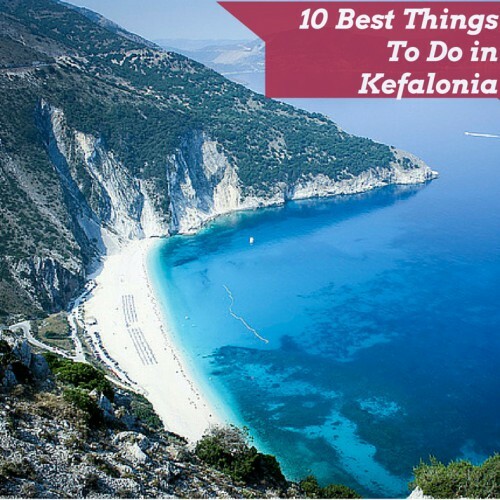 At the end, you will be treated with complimentary Greek “loukoumades” or watermelon. It gets busy in August after 21:00, so you may have to wait. It’s open all year round. Kaliotzina: Kaliotzina is a small, traditional tavern, right on a rocky beach, 2kms outside of Makrigialos, at the end of the village “Koutsouras”. Fish and seafood are the main reasons to go to Kaliotzina. The food is excellent, although the portions are not that big. Expect to pay 20 to 25 euros per person for seafood and some Raki. We liked here: fresh grilled calamari, the treats at the end of orange pie or chocolate pie, the sardines, the fried zucchini. Rovinsonas Krousos: Rovinsonas Krousos is right next to Kaliotzina tavern (less than 30 meters) and it is located on the same rocky beach with Kaliotzina. It is more “gourmet” than Kaliotzina and a little bit more expensive. It serves excellent “Tourta Chanion”, which is a pie filled with meat, cheeses and other ingredients, “Rabbit with vinegar” and other traditional dishes with a small twist. Expect to pay 25 euros per person with Raki or Beers/Wine. We liked here: lamb tsigariasto, rabbit with kritama (local herbs), tourta chanion, ntolmadakia. Makis Grill: Makis Grill is inside Makrigialos and right on the beach. It is an inexpensive solution to fill your stomach in the noon, and then get a nap on your sunbed at the beach. You can get Pita with Pork (2.8 euros) or Chicken Souvlaki, Pita with Gyros, or even a whole chicken. An inexpensive family menu here costs 26 euros (whole chicken/bread/Greek salad/ice-cream for 4 people). Things that can be improved here is the service, which is slow and we would also prefer fresh fried potatoes instead if the prefrozen ones that are used. Faros: Faros tavern is also on the main beach of Makrigialos and is a seafood tavern. The portions are fair and it is a little bit on the expensive side. H Spilia Tou Drakou: This is 3km outside of Makrigialos and it has a fantastic view on Makrigialos bay. This is not on the beach but on a rocky hill. It serves excellent lamb chops (29 euros per kilogram) and meat from Cretan animals and its seafood is also pretty tasty. Expect to pay around 20 euros per person.